Jurassic Park to be re-released in cinemas to celebrate Blu-ray launch | What Hi-Fi? Universal Pictures has announced that Jurassic Park, the first film from Steven Spielberg's trilogy, will be re-released in UK cinemas on Friday September 23rd. The cinema release is timed to coincide with the launch of all three films on Blu-ray for the first time the following month. The Jurassic Park Ultimate Trilogy will be out with a number of special edition boxes available on October 24th. See our original story below for more details. 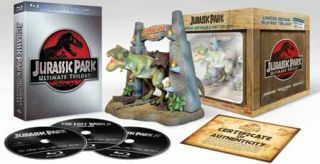 Jurassic Park is coming to Blu-ray on October 24th, with a choice of three HD boxsets and a DVD package. Restored and remastered, the three films come with more than two hours of new features and with a DTS-HD Master Audio 7.1 soundtrack. There are three Blu-ray boxsets available. The Blu-ray Trilogy and digital copy will cost £50, the Limited Edition Collector's Edition £60 and the Ultimate Collector's Gift Set £90 (pictured). Features include a six-part documentary, 'Return to Jurassic Park', BD-Live content, a pocket BLU app that delivers yet more extras to a portable and an endless number of 'Making of...' features and other behind-the-scenes footage. So, mark your cards: October 24th for Jurassic Park on Blu-ray.